One thing that I have learned from studying optimization and business models is that a lower cost model is always better. This is especially true for companies that use Pay Per Click advertising to drive new customer acquisitions. One of the most effective ways to increase traffic from your PPC campaigns is to lower your cost per click. But lowering the CPC too much will cause your ads to show up on page 2 or not show up at all. The goal is to optimize the CPC so that you save money and increase traffic to your website. 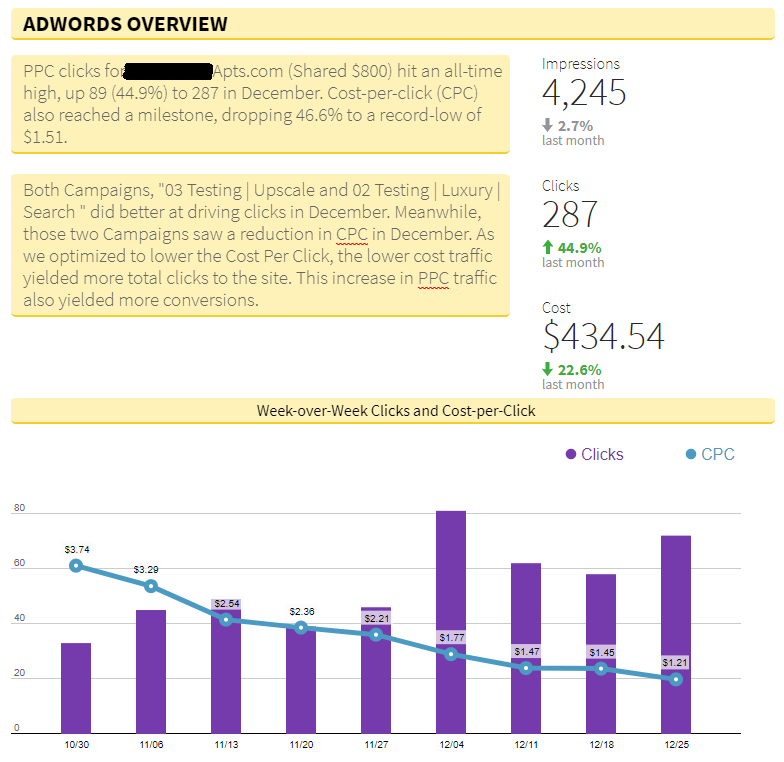 When you optimize correctly, you should see a trend line for CPC decreasing while the clicks are increasing (See Chart Below). We have found that bid optimization is best handled with bid optimization scripts or using machine learning techniques. Bidding scripts work well when you are performing linear regressions or simple optimizations when using just a few variables. Machine learning works best when you have many variables to consider other than Cost Per Click and Ad Position. The continuous variable needs to be Average Position so that you stay on top. The variable you want to minimize is the CPC as long as you do not sacrifice position. For CPC optimization, you can use Supervised or Unsupervised methods but you should know your minimum and maximum values. The maximum CPC value should be the bid amount where you are breaking even, meaning the bids are bringing in customers where the Cost Per Acquisition is breaking even. The minimum value should be the bid to achieve first page. If you are trying to optimize PPC bids on AdWords, you also need to take into account your Quality Score and Click Through Rate as both of these directly correlate to your CPC Bid. There are several methods to lower the CPC other than reducing bids. Raising your your Keyword CTR and the Ad CTR can lower your CPC. Improving landing page copy that increases your Quality Score will also lower the CPC. There are many other methods that PPC Experts use to minimize cost such as campaign settings, keywords, devices, geography, time of day and day of week. But those add more variables to your model making it more difficult to optimize. However, lowering the CPC and the cost of your customer acquisition is always good business and something to focus on!